The legacy of the Islamic potters to the world is unique. It was they who first saw the potential of white tin glaze as a ‘canvas' for ceramic decoration. It was they who first used cobalt blue on that white ground, and hence invented blue-and-white, centuries before such a colour scheme became the trade mark of Chinese export porcelain and then of European taste. And it was they who developed lustre, that extraordinarily luxurious metallic sheen, which rivals precious metal in its effects, all but turning objects of clay to gold. Without the ceramic tradition of Islam the rise of decorated glazed ceramics in Europe is unthinkable: all their original inspiration and technical knowledge came from Islamic countries such as Muslim Spain, situated around the Mediterranean. And what would Europe have been like without Maiolica or Delft, Lambeth or Nevers? Without the ceramic tradition of Islam there would have been no incentive for the Chinese to develop their own decorative porcelains, which in the first instance were aimed precisely at the Islamic market. And without that tradition there would have been no ‘willow-pattern', or the numerous other Chinoiserie designs which decorate contemporary European china. And here in England Victorian taste was profoundly influenced by Iznik and lustre, as the works of artist potters like William de Morgan vividly illustrate. Without any doubt, our material culture would have been not only totally different, but incomparably poorer, without the existence of the great ceramic tradition of neighbouring Islam. The reasons why Islamic culture should have reared such a notable tradition are as impossible to define as the characteristics of its varied ethnic peoples. But three pointers may perhaps help us in our search: a love of colour, a taste of geometry and pattern, and the ability to adopt and adapt. It is perhaps because so much of the Near and Middle East is desert that colour becomes so important. Towns like Shiraz in south-west Iran epitomise the contrast: the bare hillsides and plains give way to pomegranate groves with their brilliant scarlet flowers, to lush gardens with flower-edged water courses, beds of roses and purple bourganvilleas, to turquoise domes and multicoloured tilework. The taste for geometry and pattern owe more to the Islamic religious background. It is a common mistake to think that there are no depictions of human beings or other living creatures in Islamic art. A glance at this book will show how totally wrong that supposition is: depictions of human beings abounded in palaces and more modest homes, just as pictures of national leaders hang in public and private buildings throughout the Islamic world today. But it remains true that in a religious setting such imagery was frowned upon: it is not for man to try to usurp God's role as creator of living things. Because the calligraphing and illumination of Korans and the decoration of religious buildings provided the greatest sources of employment for artists in the Islamic world, non-figural representation inevitably developed at the expense of figural. As a result geometric and floral designs flourished in a way unknown in the icon-orientated Christian world. The ability to adopt and adapt is probably related to the position of the Near East as a focus for major trade routes of the old world. Te search for wealth and luxuries inevitably led Islamic traders far and wide: across the Mediterranean Sea in the west and the vast Indian Ocean in the east, as far as Zanzibar in the south, and through the steppes of Central Asia in the north. In addition, the European thirst for Oriental silks and spices meant that, prior to Vasco da Gama's rounding of the Cape of Good Hope, the Islamic world acted as middleman, with all the economic and cultural benefits which inevitably ensued. The skill of the Islamic potter now lies in the way he adopted the Chinese model, and adapted it to his own taste. Time and again we find that imports of Chinese wares act as catalysts, bringing a profound change in the Islamic ceramics through the enterprise of the potters as they tried first to copy, and then to make their own, the ideas that arrived on their doorstep. In the ninth century in was the T'ang white wares that pushed the Iraqi potters into using imitative, white, tin-glaze; in the twelfth it was the import of Chinese white porcelains that led to the development of stone-paste bodies in the Near East as Persian and Egyptian potters tried to emulate the translucency of the Chinese material. But in both cases, by the addition of colour and design, the resulting innovations were developed into something quite unlike the Chinese imports, works of art in their own right with a specifically Islamic character. It is a matter of great urgency, in these days of international, inter-racial, and inter-religious tension, that Islamic artistic and cultural traditions should be understood and appreciated in non-Islamic areas of the world. 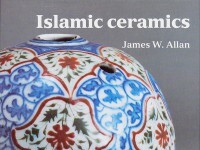 It is the hope of the author that this small book will bring to an ever wider public the works of the great craftsman potters of the Islamic past, and that through understanding and appreciation of their unique contribution to the history of the world ceramics there will grow a much deeper respect for the Islamic world as a whole.